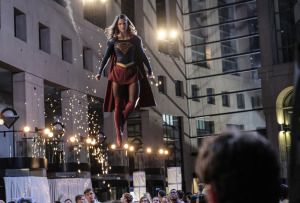 Supergirl is coming to a theater near you, probably sometime in 2021. Warner’s plans for a Supergirl movie continue the trend of adding more women leads and (hopefully, probably) women filmmakers. And there’s also a great opportunity to further diversify the genre in general, and the DC world specifically. How? By considering plenty of women of color for the lead role, which is exactly what my casting list does. So read on for my suggestions for the the ten best casting options for Supergirl! Melissa Benoist stars in the CW series “Supergirl”SOURCE: WARNER BROS.
Warner is going to make Supergirl a teenage superhero film, which is exactly the right choice. She has immense potential to draw in a much larger audience of young women and girls, which in turn can provide additional wonderful opportunities for further expanding the tonal possibilities within the DC worlds — a process already underway with Aquaman, Shazam!, and Wonder Woman 1984. And as I said, Warner could cast Supergirl with a young woman of color as well. So let me say up front that fans who object to the idea of such casting need to get over it, this is the 21st Century and these are make-believe alien people so they don’t always have to look exactly the same way they were drawn in comics during eras when nearly every superhero was created as a white person. Casting Kara Zor-El (Supergirl’s birth name) as a woman of color would help make the point that Krypton isn’t just a planet full of white people, too, which is helpful since too many films posit alien worlds where every single entity is the same single color and ethnicity. There is value in getting past simplistic notions of “every casting choice has to look exactly like a comic book drawing, and any deviation or diversity is unacceptable.” Those attitudes are not consistent with our modern world. They ignore the glaring point that most of the most well-known and recognizable superheroes were created during the 40 year period of time when few superheroes of color were created, due to publishing rules and myopic assumptions about heroes in mainstream entertainment, not to mention false beliefs about the diversity of comic book fandom. Saying “casting should reflect the original appearance and intent from the comics” is essentially saying “continue adhering to historic racial biases, segregation, and rampant lack of representation, because that’s the way things used to be decades ago.” It’s nonsense, and unless a hero’s ethnicity and/or race play a specific role in their identity and history — like Black Panther, for example — there’s no reason to avoid diversification. There’s of course also the point that changing the handful of major minority characters into white people is not remotely the same thing as changing the overwhelmingly white superheroes into people of color. If Sarah has three of something and John has 100 of the same thing, then John taking one of Sarah’s isn’t comparable to Sarah taking one of Johns — and if the reason for this gross disparity is that John had privileges and entitlements while Sarah was literally prohibited from having more than three, then seeking equity by letting Sarah have some of John’s isn’t unfair and it isn’t the same as John trying to take one of the few Sarah has. Lastly, the fact is diversity leads to big box office results — global audiences are increasingly less likely to embrace constant white-man-driven genre content, and reward an increasingly diverse set of blockbusters each year. Studios are finally internalizing this message since it’s written in dollars and cents, so besides being the right thing to do diversity is also the lucrative thing to do. So, with that little lesson in disparity and racism out of the way, here is my list of the ten best casting choices for Supergirl! Angourie Rice — My top choice for the role seems like the most obvious best choice. At 18 years of age, she’s able to play the role a few years younger and a few years older as the franchise develops. Her scene-stealing performance in The Nice Guy and a powerful supporting turn in The Beguiled prove her enormous talent, and she’s in the age-range to take on the role he way Warner intends. Yara Shahidi — My second choice is actually essentially tied for first place. Shahidi has been fantastic on the TV show Black-ish and its spinoff Grown-ish, demonstrating exceptional dramatic and comedic talents that fit perfectly with the type of film Supergirl should be. Shahidi is also in the right age range to portray both a younger version and older version of the character, as the story and franchise might require. Daisy Ridley — If Warner decides they want a mid-20s performer who can play the character younger (as late-teens perhaps) but then jump forward to a 20-something portrayal in later films, Ridley is among the top options. She’s an great actress with a built-in fanbase among genre geeks in general and especially among fangirls of all ages. Auli’i Cravalho — Although her career has mostly consisted of two key performances (in the animated feature Moana and in the TV series Rise), those performances prove Cravalho has dramatic range, charisma, and specific story experience to make Supergirl an especially resonant story for teenagers in the audience. Hailee Steinfeld — My second choice for a 20-something actress capable of both a younger and older portrayal. Steinfeld has been portraying teenage characters for several years, even after she entered her 20s, and she still easily has the talent to pull that off again for Supergirl if necessary. She’s also on my list for Batgirl, by the way. Chandler Kinney — With years of experience playing young women in various genres and settings, Kinney is a strong talent with a built-in fanbase. She’s also a dancer, so she could bring an additional level physicality to her performance that other actresses might lack. And she’s another performer who sits right in the age range needed for Supergirl. Holly Taylor — I’ve recommended Taylor for Batgirl, and that’s still the main role I think she’s best suited for in the superhero genre. But the things that make her right for Batgirl also make her a top candidate for Supergirl, from her amazing dramatic acting in The Americans to her intense physicality as a dancer with fight training. Brighton Rose Sharbino — With an intensity and wide range of genres and tonal performances on her extensive résumé, Sharbino is 16 years old, meaning she’s right on the cusp of the age range Warner needs for Supergirl. She has wonderful range, while being capable of convincingly playing the character as a teenager for several films. Storm Reid — The youngest option on this list, Reid just turned 15 years old but would be at least 16 by the time Supergirl began filming, making her another example of an actress who would really be a teenager for multiple films. Reid has experience in genre entertainment as well as dramatic roles, and she’s recently built up a growing fanbase. Mackenzie Foy — Turning 18 years old soon, Foy has a extensive resume in genre entertainment (horror, sci-fi, fantasy) as well as serious drama. Her range is impressive, and her upcoming lead role in The Nutcracker and the Four Realms will push her star even higher while expanding her fanbase among young women and genre fans. There you have it, dear readers, my list of the best casting options for Supergirl. I would also have considered Millie Bobby Brown for my casting list, but she just turned 14 so I’m not sure if she’ll be in the right age range by the time Supergirl gets around to filming. But if the production winds up beginning in early-2020, then obviously Brown would be a great contender as well. One thing is certain — there are plenty of other great performers who could also be on a longer list, or who others will prefer to my suggestions, so Warner has an excellent pool of talent to consider. Stay tuned for more coverage of Supergirl, the DC world of movies, and more from yours truly in the weeks and months to come, I’ve got some great surprises in store that I can’t talk about yet but which fans are sure to love. I work as a screenwriter for film & TV. In a former life I was a media specialist & campaign ad writer. Follow me on Twitter @MarkHughesFilms; add me on Google+; and read my question and answers about film, comics, and more on Quora.